This time I'm trying to make an acceptable jumping animation. This is the first time I'm trying the coloured blob method. I'll be working on consistency between frames first, as well as switching some of the leg movement around. In-game the animation is dependent on velocity, but it's more or less continuous so far. Like a lot of poeple here, I have been making a game for a bit. Now I've made a start to the main character's walking animation. It's my first walk animation as far as I can remember. I've only animated the legs so far. Before I add animation to the rest, is there much wrong with what I have right now or the character in general? The whole thing doesn't seem to read well below the knees. -The right hip may be too far from the center of the body. -The arms aren't of equal length. -The character appears to be too dark against light backgrounds like those of this site. Some details are pretty much lost. -Neither foot is touching the ground on frame 9. Here is a sprite sheet of the various parts drawn on top of each other, from bottom to top. the upper row is a mockup of how it should look. I recently started with an iso tileset base, so I have something to work from in the future. The tile resolution went a bit weird but the edges work really smoothly so I'm not inclined to change the resolution. The crude roman numerals are intended for referring to specific tiles. 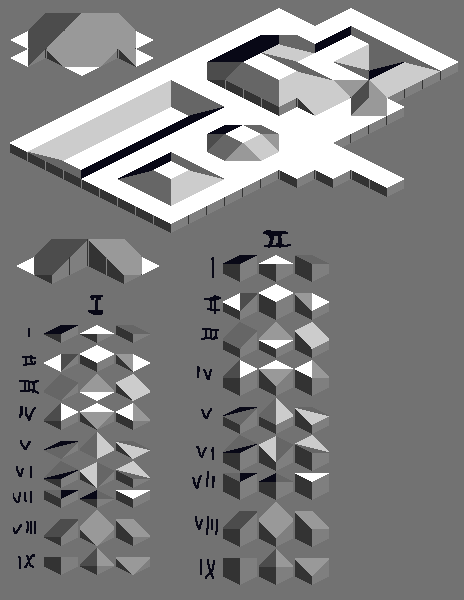 I.IX.I and II.IX.I are the north steep slopes, which wouldn't be visible if added in a mockup but might be needed if I were to make something with this. I think I have every permutation for slopes that go one level higher/lower, as well as any other appropriate tiles. I don't intend to make any steep slopes or anything outside of the ones already here. I think this is finished, but maybe someone can find improper tiling or tiles I've missed. The only things I see are some minor oddities like where multiple slopes meet in the large mockup but I don't think that's very important.